West Carroll Field Hockey has been teaching the game of Field Hockey to girls and boys in the West Carroll Recreation Council area. In 2014, we celebrated a 10 year Anniversary. 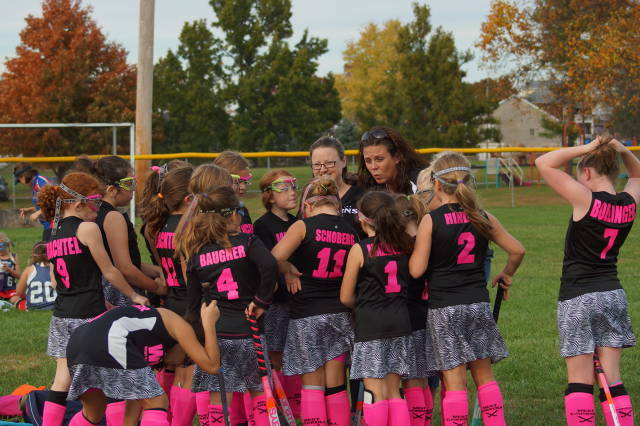 The program was started in 2005 by Laura Maring with the intention of growing the game of Field Hockey in our area. We currently serve the Taneytown, New Windsor, and Union Bridge communities. We do also support other local communities. We are one of the last “direct feeder” programs left in Carroll County. Our main goal is to teach the fundamentals of Field Hockey to the players which eventually feed into Francis Scott Key High School. We coordinate with the school coaches to ensure that the players know the basics before entering the high school sports programs. We are members of the MYFHL (Maryland Youth Field Hockey League), Taneytown Athletic Association, and West Carroll Recreation Council in Cooperation with the Carroll County Department of Recreation, Parks, and Facilities. Registration begins in May. Registration will be $85 per player for grades 3-8 and $50 for grades K-2. Uniforms are an extra cost and will be around $65. There is also an optional tournament at the end of the year which will cost additional funds depending on the number of girls that wish to participate. Pictures and Spirit Wear will also be available for purchase during the season. For Online Registration Link, click here.